First, I do not recommend that anyone else ever follow my methods. I am a persistent optimist and once I get on a story, it doesn’t matter what or how long it is going to take, it is going to get done. Blood or guts. 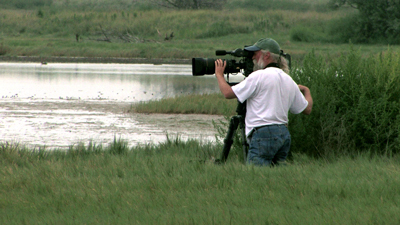 The impetus for the film came from a student’s senior thesis paper referred to on the Audubon of Missouri website. Phil Wire began his study of Greater Prairie Chickens while a student at Truman State University. A History of the Greater Prairie Chicken in Missouri. By early 2008 the country was being plunged into a deep recession so our production faltered and had only the momentum I was able to provide. 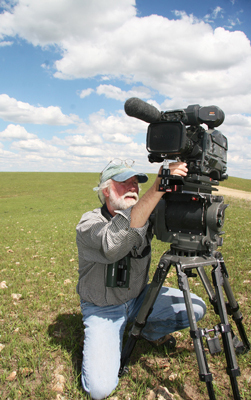 I acquired several important books and published papers and the Nature Conservancy of Missouri - most notably the Dunn Ranch - allowed me to film the precarious group of birds remaining on a single booming ground in Northern Missouri. With that I suppose we began production, but there were a host of writers before the story finally took form. Research and learning the vast array of behaviors took place over several years and I have to especially thank Dr. John Toepfer for guiding that learning, even if the old curmudgeon refused to sign a release. The ghost of Charles W. Schwartz appeared and I am most grateful for his quiet guidance throughout this film. 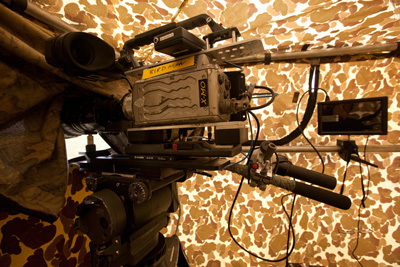 As we were able to afford them: we rented a Phantom V-10 high-speed camera, rented a fabulous gyro system, late in the film we used our Sony FS700 at 240 fps. The primary workhorse camera was the Sony HDW-730. 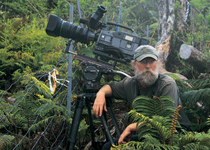 Most footage was acquired on tape before being captured digitally. Time-lapses were primarily from Canon 5D mark II and the Dynamic perception Stage Zero dolly. Production support from the Edward K. Love Conservation Foundation, the Wolf Creek Foundation, and Prairie Fork Ranch were timely and critical to maintain any flow. Because of their generosity, we filmed in Texas where the last male Attwater’s Prairie Chicken (subspecies of Greater) still danced. I understand these birds are now gone. I specifically did not film in Illinois because there was just so much disturbance. Birders and outdoor people naturally want to see these cool displays each spring, but there are only so many birds left in some areas. At what price does our need to see become a detriment to the breeding and productivity? We used off the shelf Macintosh MacPro with Final Cut Studio and Final Cut Pro 7.0.3 for final editing. DaVinci Resolve for color correction. Live type for most titles and Motion for others. Many, many hours have been spent getting the film into the form you see today. I nearly wore out an Old Ford Explorer then bought a Freightliner Sprinter and put over 100,000 miles on that too. But, the most reliable car I’ve ever abused now has 333,000 miles on it. I strapped timelapse rails, ladders, cranes and tripods to the roof rack, while filling every inch of the interior and trunk with everything needed including blinds, weights and more. I just had to replace the both rear springs struts and shocks while I endured lectures about not overloading the car from my mechanic. Honda makes great vehicles that I have abused like a 4 wheel drive and I got between 47.3 to 39.3 miles per gallon using this fine machine. Thank you Honda. You don't tell a natural history story by staging things on a Hollywood set. No luxury accomodations are hiding in the expanses of prairie where the shooting took place. I camped, moteled, slept in the car… you name it.